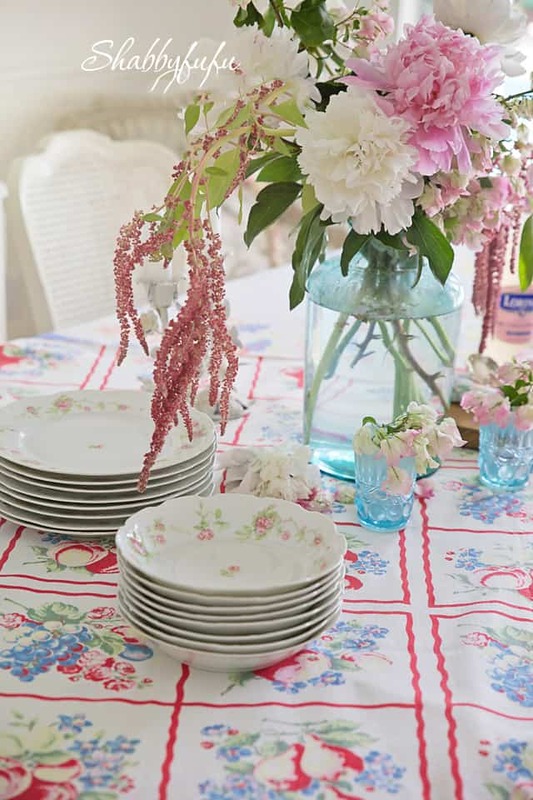 I love your table clothes–I am a hoarder of linens! Ha ha. 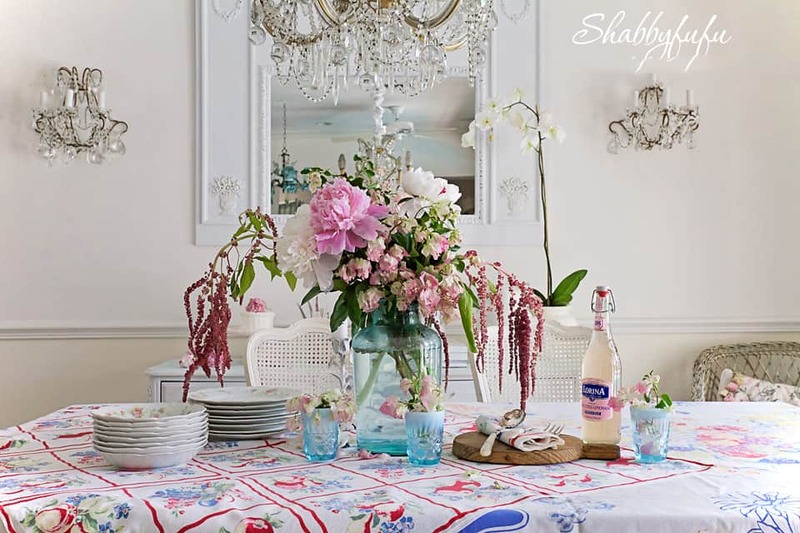 Gorgeous table–I want to come over and have a treat! Beautiful! 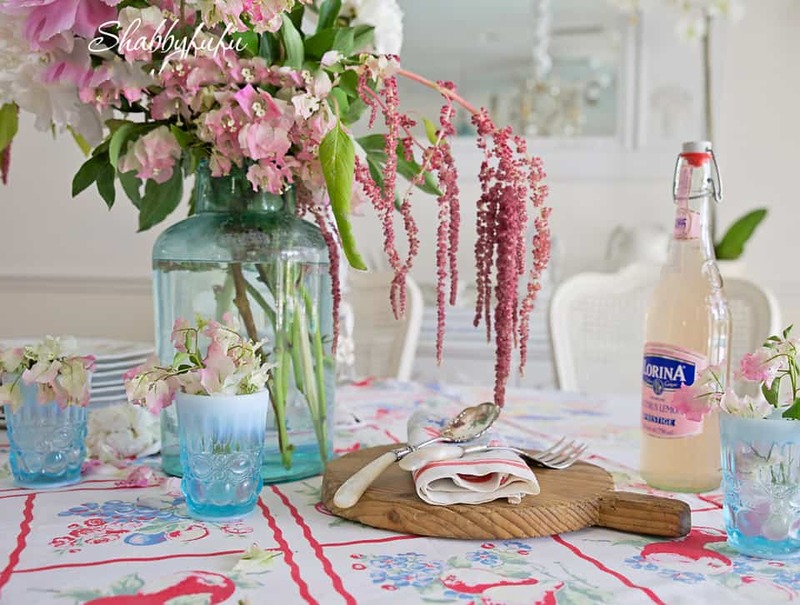 This vignette makes me feel like summer! 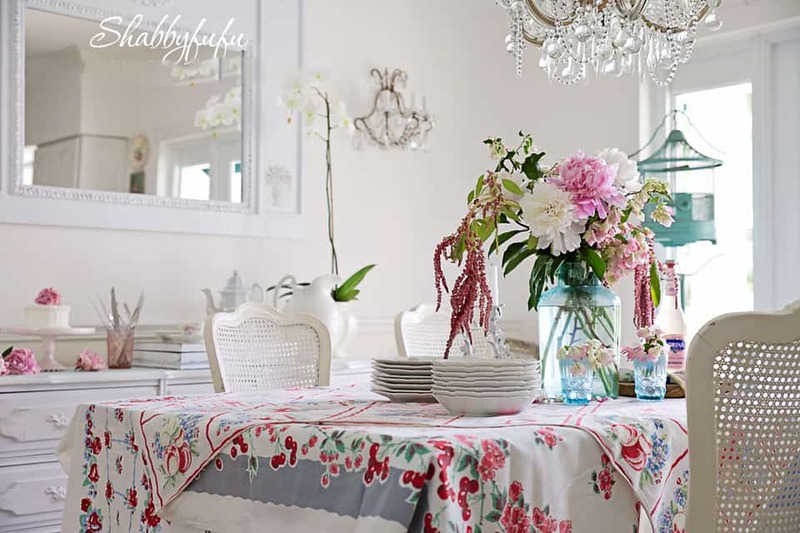 Oh Janet…Sooo pretty & I love the vintage tablecloths!!! Looks so inviting & cottage styling is my favorite:) You are the master at it & I have learned thru you over the years! Love ya.. I miss my vintage tableclothes. I had many, but sold them all on impulse when I needed to fill my booth. Love your table. Everything is just so sweet…I'm not sure what I like the best! 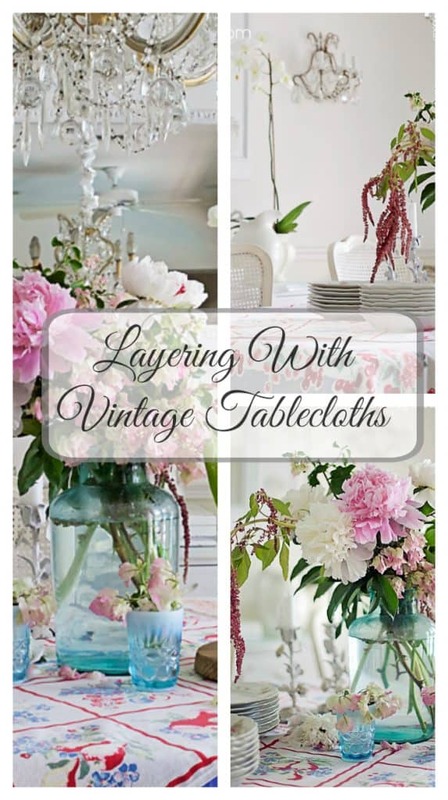 Love your vintage table clothes. Everything looks so springy and pretty. Hi Janet, this is beautiful! I’m sitting here in Topeka, KS, with a whole lot of snow outside, so this is extra awesome looking. I’m so glad that you liked this post Debbie! I have a strawberry print vintage cloth and napkins that were my Mother’s. They have been around for as long as I can remember… 70 plus years. Hi Deb! I have a small collection still and just love the cheer that they bring. Glad you stopped by. Hi! I do not see many of these vintage cloths. It is good to see your lovely table. 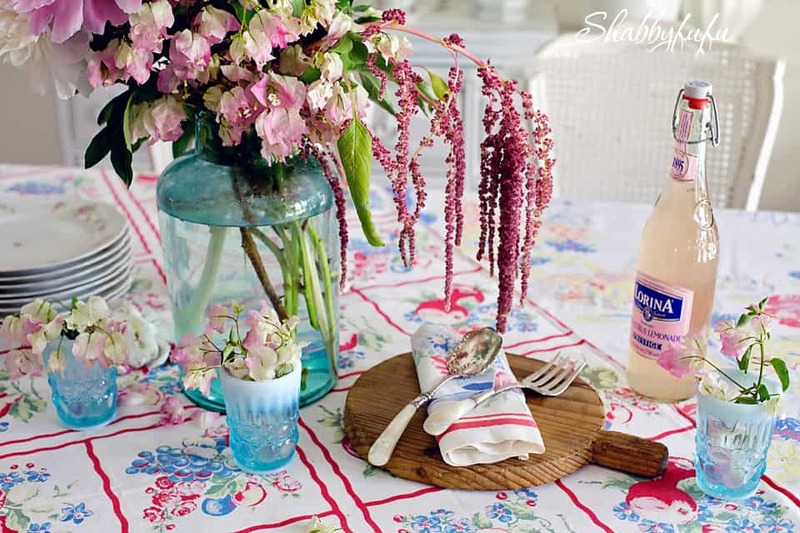 I have a strawberry-print vintage cloth and napkins that were my Mother’s. They have been around for as long as I can remember… 70 plus years. The cloth was well used on our large dining table as I grew up. It shows wear and love. Hi Linda! I have my grandmother’s old strawberry tablecloth and I just find these so charming. Have a wonderful weekend! Love the table set with the limoges. I have to say I love all sorts of dishes. Transferware and Limoges are my favorite. Don’t know what it is I have a thing for smaller dishes. Always have. 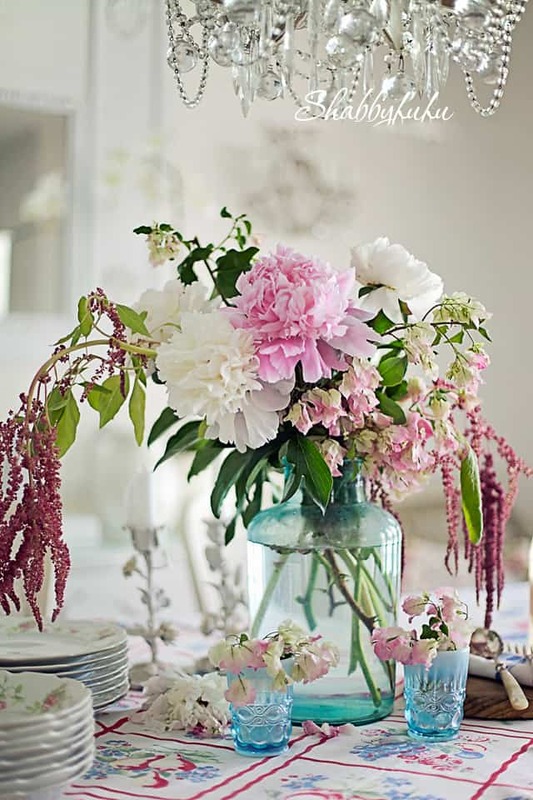 Flowers in the Mason jar are pretty.